Amazon uses the voice recognition software Alexa to control its' products the way Apple uses Siri. Amazon Echo is the name of the smart speaker that is powered by Alexa. There are three versions of Amazon Echo all which have far field, noise-cancelling microphones. AMAZON ECHO: The original Echo is the size of a pillar candle. The bottom half of the device contains speakers which can produce relatively loud music. 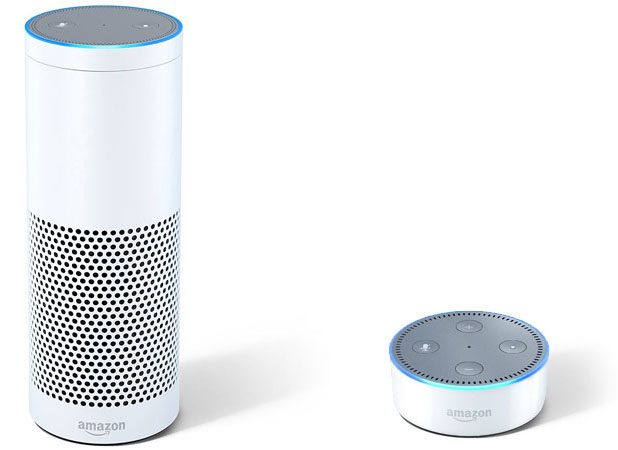 AMAZON ECHO DOT: The Amazon Dot is the same diameter as the original Echo but is significantly shorter. While the Dot has a single speaker, it is obviously not as powerful as the original Echo. The low profile is often preferred for aesthetic reasons. AMAZON ECHO TAP: While the other two Echos are always listening, that is not the case with the unpopular Echo Tap. As the name implies, the Tap has a button on top that must be pressed in order to activate Alexa. The Tap was designed to be portable, but since it requires a Wi-Fi connection (and doesn’t work off 4G) its' external applications are limited. Amazon Echos can only be purchased from Amazon. An Amazon Prime account and Wi-Fi both are needed for Echo to work. Alexa has “skills” which allow her to integrate with other devices and services. These skills have to be downloaded to the Alexa app before they can be used. Echos must be properly placed and out in the open. They cannot be hidden in cabinets. Amazon Echo is a rare example of a device that was designed for the DIY market transitioning into the realm of high end automation. While no voice recognition will ever be perfect, Alexa does a really good job of understanding most adults and can even recognize accents. Rather than reinventing the wheel manufacturers such as Lutron and Control4 decided to integrate with Amazon Echo. Since Amazon Echo is a mass market product which is priced accordingly it does not have the built in security that comes standard in professional automation equipment. Simply connecting an Echo (or any other DIY device) to your network, can compromise it. This leaves your network vulnerable to hacks and issues like identity theft that are accompanied by hacking. By popular request, we offer an Alexa integration service. Simply purchase your Echo devices via Amazon and then give us a call. We will set up the devices ensuring they have the required skills and are properly located. We also make sure the devices are on a secure wireless connection. Finally we test all of the Echos and verify the integration is working properly. To learn more about HTE's Alexa Integration please fill out the form below.